The 13th of December is the St Lucy’s day (Lucia) which is celebrated in Sweden and in other Scandinavian countries. 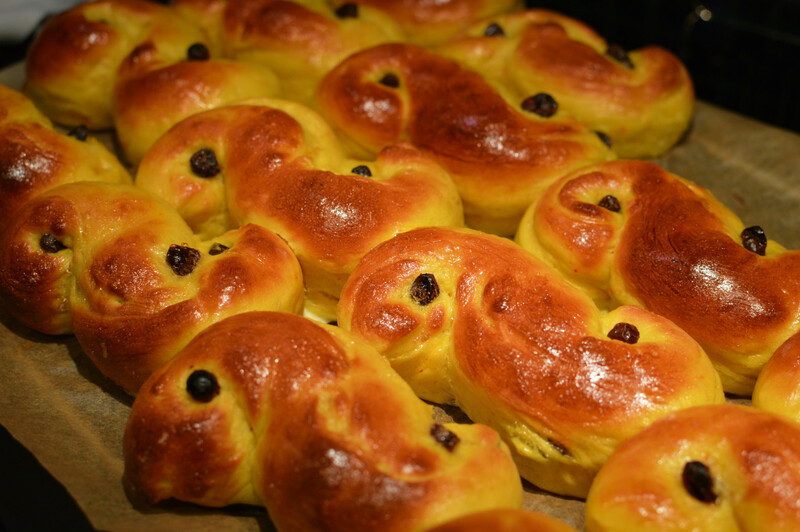 Celebrating Lucia is always accompanied with eating delicious Swedish saffron buns called Lussekatter or Lussebullar, or even Saffransbullar. It almost always goes together with some hot mulled wine (called glögg, see our traditional recipe here) and gingerbread (pepparkakor). Even though lussekatt is strongly related to the celebration of Lucia it is fairly common to eat it other days in December as well. Don’t use too much saffron since it dries out the dough, instead you can use less saffron but gain more taste by letting it soak in cognac for a few days (2 tbsp cognac to 1 g saffron). Another trick is to use whole saffron and grind it yourself. Add the flour gradually while stand mixer is stirring on low speed. You might need to add more flour to make it possible to work with the dough without it sticking to all of your fingers. Bon appétit! Check out some of our other sweet recipes and Christmas recipes.